This was the scene two weeks ago outside of our second story window here in Bethany, northwest of Portland, Oregon. 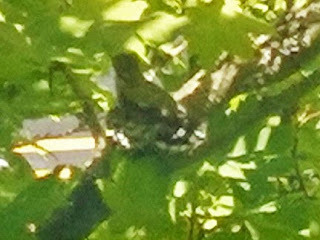 A tiny hummingbird nest on a branch in the maple tree, fifteen feet above the ground below. "Hope," the mother hummingbird, is off collecting food. Her tiny hummingbird hatchling, hunkered down, waiting for food. Hope has delivered food in the past. Mother won’t fail now. Or so the hatchling hopes. Today, on July 2, the tiny hummingbird looks very different: more mature, with wing feathers, a long beak. Its shiny breast feathers mark it as a mature hummingbird Rufous Hummingbird. It's matured so rapidly that it's absolutely amazing! Now only one thing is lacking. Baby really needs to leave the nest and fly. And the first flight seems to be a huge challenge. Today, Hope still delivers food but not as frequently as two weeks ago. Instead, she spends a lot of time fluttering around the nest, demonstrating how to fly, then fly down, sitting on a nearby twig, flying again, perching nearby again. So how is the young bird reacting to this coaching--this urging? Well, it’s sitting up in the nest, holding its tiny head high. It absolutely twitches with energy. It sometimes stands on the edge of the nest and flaps its wings. Is it practice flying? But so far it hasn’t launched! Mom keeps returning after foraging for nectar. She lands on a nearby branch and coaxes and urges. No luck yet. Do you remember how your parent coached you on your first bike ride? I guess it's not that much different with learning to fly. After watching this for a couple of days my wife and I are caught up with suspense. We wonder: if I were that hatchling, would I be brave and fly? I think I’d be afraid to launch, just like the bird. The firm earth is about twenty feet below. The amazing thing is that Hope has never failed. She has nursed the hatchling along through three stages: egg, chick, and "teenager." How does she know to do all of this, not to mention the making of the nest from materials like moss, down, and spider webs! We’ll watch. If I can get better photos I’ll show them to you here. Happy Fourth of July to my American readers and American hummingbirds, starting with Hope and her hatchling! July 2, 9:00 p.m. Western Daylight. In the dusk I check the nest. It's empty. Hope has prevailed finally. She and her hatchling are gone. My wife and I feel a little happy and a little sad. Image of the empty nest, center of the photo above the double yellow line.